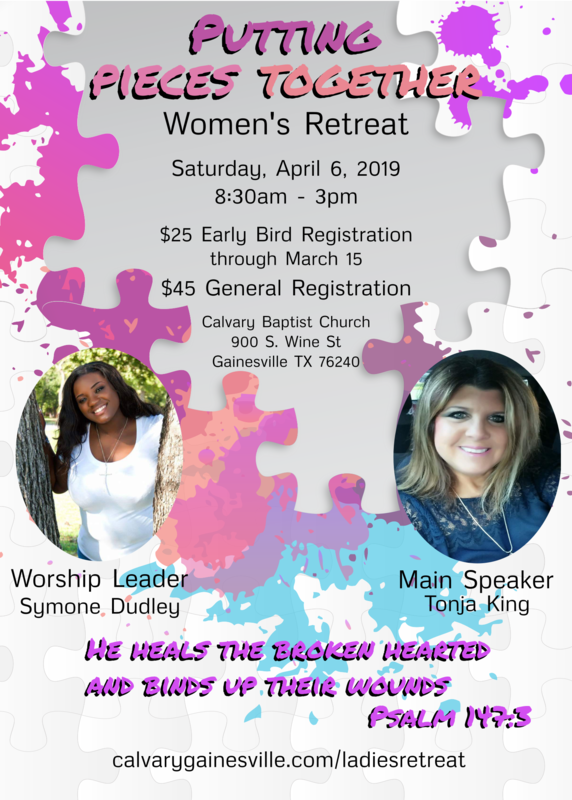 We want to invite you to a one-day Women’s Conference on Saturday, April 6, 2019 at Calvary Baptist Church in Gainesville, TX. Come hear powerful testimonies from your fellow sisters-in-Christ of how God has been Putting Pieces Together in their lives, and how He can do the same for you. We will have three sessions with our conference speaker, Tonja King, who will be sharing her personal testimony and a compelling message. There will be dynamic worship led by our amazingly gifted worship leader, Symone Dudley. We will have three breakout sessions, including special guest, Kim Cook from Abigail’s Arms. Registration forms and promotional flyers are located at the bottom of this page. We are anxiously awaiting to see God move during this one-day conference and we hope you will join us.